Even if you saw Neon Lamp, unless you know you just think as incandescent bulb. If you see the photograph, you’ll immediately identify the thing inside your house like in some plugs. They are NE-2 Neo Lamps, lighting since 1838. They were co-invented by Sir William Ramsay, who discovered Nobel gas too. The other inventor was Morris Travers. Morris Travers established Indian Institute of Science with support from industrialist J. Tata. Morris Travers was a FRCS surgeon. Morris Travers also introduced aseptic techniques in surgery which still followed. Travers still has a British company. 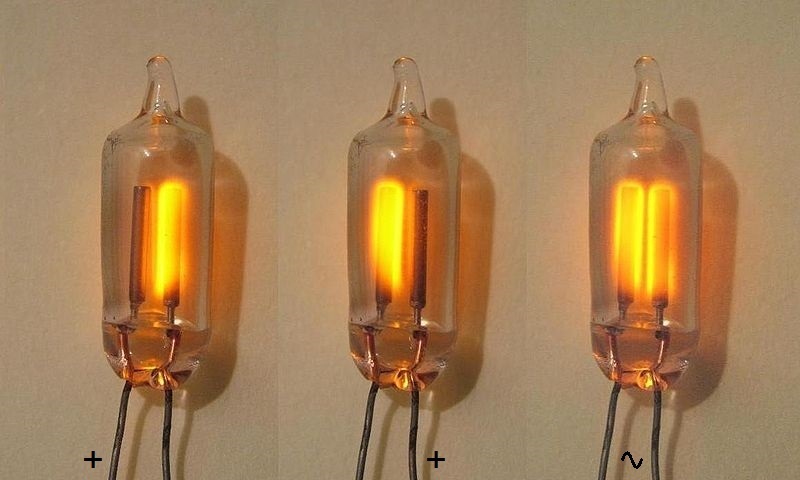 Here is Brief About Neon Lamp (Power Indicator) and Nixie Tube Which We Need to Know For Electronics Development. Those things clone now made with Filament LED Bulbs (Faux Vintage Bulb). These small, low power lamps use the principle called corona discharge – an electrical discharge by the ionization of a fluid surrounding a conductor which is electrically charged. Example of corona discharge is X-Ray. Later Moore mounted two electrodes and added neon or argon gas, they glow bright color depending on the gas. Neon signs still today used. Why that 200 years old Neon Lamp still used despite having LED? Neon Lamp has two bars, like [ || ]. In AC, each alternatively glow and looks like both glowing like [ || ]. The rate is closer to frequency – 60 times per second. If you use a digital camera with lower frame rate, you’ll perceive the alternate glowing. It will not glow below voltage 90 V. In DC line, we can identify which side is positive or rather positive or negative DC, like [ | ] or [ | ]. If your NE-2 Neon glowing then line probably enough to run load as most equipment operate at 110v AC. 90 and 110 not far away. Travers written – “the blaze of crimson light from the tube told its own story…”. Needless to say, they are practically “plug and play” unlike LED which will need a minimum circuit. This is also why neon is used line testers. Nixie tube is nothing but stack of digits one after one like 6 7 5 8 4 3 9 2 0 1 inside a tube which works with same mechanism like that of Neon Lamp. That is typographically designed so that cathodes in front obscure the lit cathode minimally. Obviously, each digit has own pin to activate. Nixie relatively continued growth to newer and also had IC. This Article Has Been Shared 7854 Times! Cite this article as: Abhishek Ghosh, "Neon Lamp (Power Indicator) and Nixie Tube," in The Customize Windows, May 19, 2018, April 25, 2019, https://thecustomizewindows.com/2018/05/neon-lamp-power-indicator-and-nixie-tube/.